Oh, sweet little Abigail... She is one of my all time favorites. And Little Sitter sessions are also one of my all time favorites... they are SO much fun. Baby is happy, chubby, smiley, and can't quite run away just yet! Don't miss capturing that sweet time on camera of your little one(s). You'll be so glad you did capture it! Such a little beauty and such a joyful little girl. Not to mention how fun her Big Sister is! 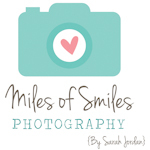 Enjoy a peek into some of what we captured during this Miles of Smiles Photography session.